(4) 1947 - 1953 Chevy 1/2 Ton Pickup Truck Retrofit Hubcaps / Fits Ford Style Wheel Centers Only Fits 1940 - 1956 Ford Original Gennie, Artillery, and Solid Wheels. ( Does not fit original Chevy wheels ). 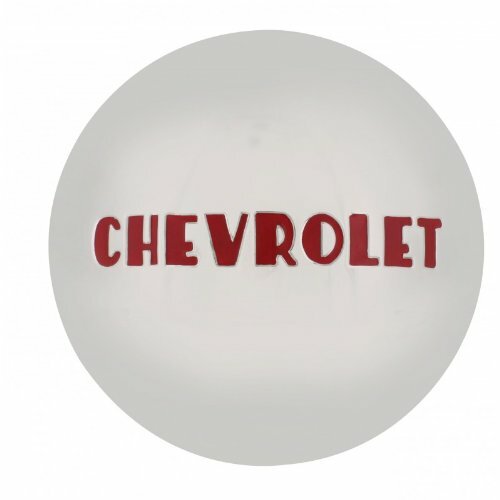 Manufactured for Chevy 1/2 Ton Chevy Pickup Trucks with Ford Aftermarket Wheels. Set of (4) Highly Polished Stainless Steel Hubcaps with Painted Red Logo. GM Restoration Licensed Product. If you have any questions about this product by United Pacific, contact us by completing and submitting the form below. If you are looking for a specif part number, please include it with your message.